Recent blog discussions have starkly highlighted the different values and priorities for scientists, bloggers and (some parts) of the mainstream media. For working scientists, the priority in any discussion about science should be accuracy. Methods, results, and interpretations must be clear, logically connected and replicable by others. For people who haven’t experienced a joint editing effort on a scientific paper, it might surprise them to see the strength with which seemingly minor word choices are argued over. This process is particularly stark in short format papers written for Science and Nature, (and increasingly for press releases), where every word is at a premium. For many scientists then, the first thing they look for in a colleagues more ‘popular’ offerings is whether the science is described clearly and correctly. Of course, this is often not the same as judging whether it succeeds in improving popular understanding. Indeed, the quality of the science is almost always how a popular piece is judged by scientists, regardless of the final conclusion the author comes to. For instance, my review of Tim Flannery’s The Weather Makers was very critical, because his conception of how the science worked was poor, regardless of the fact that his conclusions are aligned to my own in many respects. The furor over the Soon and Balinuas paper in 2003, was much less about their conclusions, than about the nonsensical manner in which they had arrived at them (combined with disgust at the way it was publicised and promoted). Our multiple criticisms of Henrik Svensmark have focused far more on the spin and illogic of his claims concerning the impact of cosmic rays on climate than it is on the viability of the basic mechanism (which remains to tested). The underlying principle is that proposed by Daniel Moynihan, that people might be entitled to their own opinions, but not their own facts. The media on the other hand is mostly fascinated by the strength of the narrative. The enduring ‘heretic’ meme – the plucky iconoclastic individual whose ideas are being repressed by the establishment – is never very far below the surface in almost all high-impact scientific profiles, for instance, Freeman Dyson’s NY Times magazine piece last year. To be sure this is a powerful archetype even in how scientists see themselves (shades of Galilean hero-worship), and so it is no surprise that scientists play up to this image on a regular basis. Craig Venter is someone who very successfully does this, possibly with some justification (though YMMV). However, this image is portrayed far more widely than it is valid. Svensmark, for instance, has gone out of his way to mention that he works in a basement on a shoestring budget, having to work weekends and holidays (the horror!) to pursue his ideas. For such people any criticism is seen as the establishment reaction to the (supposedly revolutionary) consequences of their ideas. This of course would be the case for true revolutionaries, but it is a very common attitude among the merely mistaken. It is not difficult to see the attraction in being seen as the iconoclast outside the mainstream in a scientific field that has been so polticized. There is a ready audience of misfits and partisans happy to cheer any supposed defection from the ‘consensus’, and there are journalists and editors who, in their desire to have ‘balance’, relish voices that they can juxtapose against the mainstream without dealing with crackpots. Witness the short-lived excitement a couple of years ago of the so-called ‘non-skeptic heretics‘, such as Roger Pielke Jr., championed in the New York Times. In truth, there is very little that is ‘heretical’ in any of these voices. Only someone with no experience with the way science is actually done — try going to an AGU meeting for example — would think that scientists being upfront about uncertainty and following the data where it leads is any kind of radical notion. The self-declared heretics do get criticised a lot, but not generally because of the revolutionary nature of their ideas, but rather because they often indulge in sloppy thinking or are far too quick to allege misconduct against scientists (or the IPCC) without justification, perhaps in order to bolster their outsider status. That does not go down well, but to conflate ‘mainstream’ expressions of distaste with this sort of behavior with the belief that the actual ideas of ‘heretics’ (about policy or uncertainty) are in some way special or threatening, is to confuse the box with the cereal. There are a couple of tell-tale signs of this ‘Potemkin heresy’ that mark it out as not quite kosher. First, for the heretic who has a coherent alternative to the orthodoxy, it is very unlikely that this alternative will be in line with the thoughts of all the other outsiders. True heresy is actually very lonely. If alternatively, the ‘heresy’ consists of thinking that every idea that pops up is worthy of serious consideration, they are simply throwing away the concept of science as a filter that can actually take us closer to reality. If every idea must now and forever, be considered anew whenever someone brings it up, no progress is possible at all. Science works because it can use observations from the real world to move on from unsupported or disproven ideas. All ideas are in principle challengeable, but in practice, unless there is new information, old issues get resolved and put aside. The seriousness of a new ‘heresy’ then, can be measured in how much shrift is given to the crackpots. As Sagan said, one should always keep an open mind, but not one that is so open that your brains drop out. The second sign that all is not well is in how well the supposed heretic understands why they are being criticised. Usually this is stated up-front by the critics – for instance, I have criticised Judy Curry for not knowing enough about what she has chosen to talk about, for not thinking clearly about the claims she has made with respect to the IPCC, and for flinging serious accusations at other scientists without just cause. Similarly, we have criticised Roger Pielke Jr. for frequently misrepresenting scientists (including me) and falsely accusing them of plagiarism, theft and totalitarianism. That both interpret these critiques as a disguised attack on their values, policies or scientific ideas would be funny if they were not so earnest. (For reference, we are just not that subtle). Unfortunately, the narrative of the heretic is self-reinforcing. Once a scientist starts to perceive criticism as an attack on their values/ideas rather than embracing it in order to improve (or abandon) an approach, it is far more likely that they will in fact escalate the personalisation of the debate, leading to still further criticism of their conduct, which will be interpreted as a further attack on their values etc. This generally leads to increasing frustration and marginalisation, combined quite often with increasing media attention, at least temporarily. It very rarely leads to any improvement in public understanding. The fact remains that science is hugely open to new thinking and new approaches. Indeed, it thrives on novelty. New data from new platforms, new calculations enabled by the increases in computing power and new analyses of the ever-increasing amount of observed data, each have the continual potential to challenge previously held ideas – if that can be demonstrated logically and with evidence to back it up. A recent example of a potentially dramatic new finding was the Haigh et al paper on solar forcing. If true, it would turn almost all work on solar effects on climate on its head, and they had no obvious problem publishing in Nature. This idea of knowledge sitting on a knife edge ready to flip whenever some new observation or insight arrives, is the reason why science is so exciting and fascinating. That is the reason why science deserves to be the story, and why journalists should be continuously searching for the ‘front page’ thought that will allow this story to be told to a wide audience. But all too often the real story is neglected in favour of a familiar well-worn, but inappropriate, trope. It is clear that scientists’ obsession with clear thinking over narrative handicaps our attempts to communicate the seriousness of the climate change challenge. But since the media will continue to favor compelling narratives over substance, that is the method by which this debate will be fought. Nice article Gavin. But a bit round-about way of talking about and to Dr Curry, no? With Dr Curry’s Italian flag analysis, although one would be hard-pressed to impugn her of novelty, the real value in her approach lies in the mere fact that, within the IPCC frame of evidence evaluation, there is no concept whatsoever of how to handle evidence that goes against a certain hypothesis. [Response: I have no idea why you say that. There are many issues in the IPCC report where the evidence for one effect or another was ambiguous – cosmic ray effects, the magnitude of cloud feedback or indirect aerosol effects etc. The solution is to have to try and constrain the pdf for the magnitude of the effect. If that pdf includes ‘0’ then you are obviously including evidence that something is a positive or negative effect, or even that it is not much of an effect at all. However, such a pdf might still be predominantly weighted on one side or another, and that is still useful information. Very few issues are binary (yes/no) – almost everything in climate is a continuous variable. The question is not “is climate sensitive to CO2 change?’ but ‘how sensitive is climate?’, so the language of distributions and Bayesian probability is the natural way to be looking at issues of uncertainty, and of how much confidence can be given to specific statements. The most telling thing to me about the band of outsider deniers is that their new “unorthodoxy” is just the old orthodoxy. AGW is the heresy. The denier are just trying to mount a counter-revolution. It’s as if the people who backed Anastasia as the lost Romanov heir had tried to paint themselves as revolutionaries. I can’t tell whether the shift to story telling over reporting in the news is more about laziness or contempt for the audience, or if it’s just a concoction foisted on the world by MBAs just out of school. I agree but I’d also say it’s not the scientist’s job to do so. We’re all competent in some areas but less so (or much less so!) in others. Scientists have all the skills and abilities for doing science but many of those run contrary to running a good media campaign. I understand scientists are human and it’s difficult to sit idly by when looking at the problems we face but scientists can’t also be activists or be perceived to be advocating a particular type of action. Otherwise it makes the issue look as if there’s just one set of people with an opinion on one side and another set of people on the other with no objective facts in between. At some point we have to either hope or have faith in the fundamental reasonableness of the human race and say that some issues (e.g. “climategate” or a cold winter) will shift the public perception in the short term but good science will always win. If critics are gaining a foothold then the solution is more science not for scientists to get down in the pit with them. I like this piece. It fits with my mental map of science and its progress. The science landscape is like a glacier landscape (an old-fashioned one with lots and lots of ice, that is). The glacier moves through the landscape and all the abandoned or foolish proposals just finish up as moraine littering the sides and the dead-ends. Some people might try and throw it back onto the body of the glacier, but it just moves on, always shifting the useless stuff to the sidelines. Excellent, thought-provoking post. It’s quite true that the impulse to use narrative (which, trust me, was not invented by MBA’s) can force substance into second place. But must it always? Can anyone here think of an example of writing that’s both narrative AND faithful to the science? This is complete, utter horse pucky. Evidence is evaluated probabilistically–regardless of its implications. All Curry–and you, for that matter-does in her criticisms of the IPCC is demonstrate her ignorance not only of climate science, but of scientific method in general. Well how about Gavin’s post? Re: MBAs. Fair enough. Eyeballs to advertisers is no doubt part of the equation, though. Yes, Gavin’s “Picturing the Science” is indeed an excellent example. I find it endlessly frustrating that that book doesn’t get much more attention than it has. As for denier tactics, let me be the 10,000th person online to recommend “Merchants of Doubt”. One warning: If you’ve lost relatives to smoking-caused cancer, as I did (my parents), the opening section in which Oreskes and Conway detail with clinical precision the way the tobacco companies lied to lawmakers and the general public will be tough to read. When you see the connections between that effort and climate deniers, you’ll be left speechless. I am using this post for my Chemistry class. We are always discussing the importance of reliable sources but sometimes arguing the definition and identification of \reliable\. The \Galileo\ complex has come up several times, or as Sagan has addressed, the Galileo v Bozo the Clown analysis. Results: our instruments gave us the readings summarized in tables 1, 2, 3, etc. Conclusions: (pending replication), we have shown that A makes B more frequent and C more intense; then C feeds back to increase A, which makes B even more frequent and C even more intense; etc. Policy implications: this is happening (we believe, pending replication and survival of detailed professional criticism), and if it continues this way, we’ll be able to observe the following in the upcoming 20 years: forecast 1, forecast 2, etc. The tv drama E.R. portrayed scientific narratives along with narratives of interpersonal conflict and personal development. Most of the narratives of climate science can’t be presented as the medical narratives were, and the common attempts to try to mix the climate science narratives with the personal and interpersonal just do not work as well; the drama clouds the science. What you say can hold true, only if “measured temperature record” and “model projected temperature for 20th century” are mathematical equivalents which are inter-comparable. To reach “N(0.6, 0.1)”, assumptions are required and JC’s assessment pertains to the level of confidence that can be placed on the very process of doing so. In other words – she is putting forward a meta-analytic principle, and not a internal analytic one. Thus, JC provides her evaluation of 30:50:20 for where the models fall, when then in turn relates to the >95% confidence assessment. This is, going by her framework. Whether to view different model outputs as representing a range, and therefore amenable to be arrayed along a pdf, or not, is a question of perspective ( believe the rift lies here). There can be 20 different models, but only one ‘real climate’. In other words, there can be only one correct model output (if any), and 19 wrong ones. This is especially true seeing as we declare a priori that climate models as being deterministic. Going by what you suggest, a set of models will _always_ produce a pdf that will span observed climate. Are climate models which consistently produce outputs completely at odds with observed temperatures reported in the literature? The carbon fuel industry sees climate science as a business impediment. Attacking science is just a business decision. Nothing personal. If the story hasn’t got real people (cute animals are next best) and, preferably, interpersonal conflict or love in it, the media are not very interested. Reasonably so, from their point of view, since they know that people are more interested in people than in things. The media know it and advertisers know it, so the question of who drives it is pointless. A story of flooding therefore focuses on victim impact, not meteorological causes or river flow rates, and a story about a novel often focuses on the writer, not the book. Apply that model to climate science reporting and you get stories about scientists – especially if a feud can be drummed up – not about the science. At best, you get stories about likely AGW impacts on people. Science per se will be often be described as ‘too abstract’ or simply ‘boring’ but what they really mean is that it has no human interest. That’s the problem. Perhaps someone can find a simple solution that I haven’t seen. True, in that it’s meta-something, and not analytic-something else. No creationist could argue against biology with more skill (sic) than JC argues against climate science. Creationism isn’t religion, it’s science that’s religion! Right wing politics aren’t dogmatic, it’s science that’s dogmatics! Has she burned her last bridge, now? Are there any other bridges left for her to burn? Hard to imagine. I’m assuming that she’s heartened by 1) her being embraced by the right-wing anti-science camp and 2) the reality we’ve all known for the last few weeks that the Dems were going to be flushed down the toilet. I agree with Mike Lemonick — this is an excellent, though-provoking post. (So much so, it’s actually bugging the crap out of me, in a good way.) And I also agree that good narrative and accuracy do not have to be mutually exclusive. Quite the opposite, in fact. I found Freeman Dyson to be a fascinating and worthy subject for a profile, however flawed his perspective on climate change might be. The real question is whether the profile does a nuanced job, and brings out legitimate and revealing insights about the human condition. Gavin uses “pdf” inline replying at 2 and 14. It is neither. Rather it is the natural consequence of the explosion of news media outlets, and the corporate decision to view the news as a means of making profit rather than a solemn public service. I think climate science could learn a lot from physicists – no, not about clouds – about crackpots! After all, try to find a single physicist who has not had a crackpot idea hurled at them by a later-day Galileo claiming that the speed of light isn’t a constant and that their theories are being suppressed by the mainstream establishment. Anand, I would go further than Gavin on this (or be more explicit). Specifically, coming from this from the perspective of philosophical training, when I think of \unknown unknowns\ the first thing I think of is the question of the reality of the external world. Put in popular terms, what is the probability that we are all in a Matrix like construct, in which all data (scientific or otherwise) are just constructs of a supercomputer? The only things we know definitively about this possibility is that it is not a logical impossibility, the probability of its being true is unknowable in a strict Bayesian term, but that it is probably very low. \Probably\ very low because the argument that demonstrates that is not deductive. Now, that possibility may be very interesting to philosophers, but do the IPCC really need to take it into acount in their probability assesments? What about the Humean possibility that the world is entirely random, with no fundamental forces or masses, or energys, but by coincidence it has till now appeared to be a coherent world? Again, this is logically possible – but does that matter to the IPCC? These may seem absurd possibilities (in many ways they are), but the point is that there is no in principle way to exclude them from the range of possibilities in the white section of the flag. What is worse, for any finite set of data, there is an infinite number of theories consistent with that data whose predictions going forward vary arbitrarilly. In other words, the white section of the flag must allow for literally an infinite number \unknown unknowns\. Contrary to Gavin, these alternative theories all have a non zero probability (they are not logically contradictory) and so they do effect Bayesian probability calculations. But because there are an infinite number of them, it is literally impossible to define the probability of their disjunction, ie, the probability that at least one of them is true. The white section of the flag, then cannot be delimited. 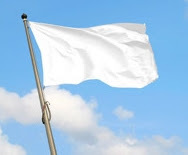 We simply cannot know what portion of the flag should be white, if we were to allow that into our calculations. For that reason, all science procede by the pairwise comparison of theories. We cannot know the absolute probability that any scientific theory is true. What we can know, or at least place a range on, is the relative probability that one of a group of known theories is true compared to the others. We cannot know that the probability of AGW (or any other scientific theory) is 95% given the evidence; but we can know that the probability of AGW being true, given the evidence is at least 20 times larger than the probability that any one of the known alternatives to AGW is true. The most important point, however, is that this restricted knowledge is not a limitation on science. So long as we always go with the better theory in our pairwise comparisons, science will always, advance. The information content of our scientific theories will always continue to approach the information content of the universe. This fact has been known since at least Karl Popper made it clear (ie, over 70 years). Furthermore, it is irrelevant to policy. In fact, outside of science the same problems of radical uncertainty hold. The only difference is that outside of science, we are often unable even to distinguish which is the better of two theories. So, if the white in the flag in science were a problem for policy, it would stop the rational development of policy in all cases. 3) Can reproduce the warming from 1955 to 2005 (or a host of other observations). That does not mean the models are evidence for AGW theories, or against anti-AGW theories. But it does mean that there are no viable anti-AGW theories in the field at the moment. At best there are a few hints as to where we might look for such a theory, and none of the hints look promising. Now, that fact should concern any sceptics. The news that they have no viable theories in play should make them rethink, if not their opinion, at least the wasy they suport it. The proponents of AGW have already gone to great expence to develop your anti-AGW theories for you, and not found a suitable candidate. If you still think they are wrong, isn’t it about time you put in the legwork and developed a viable alternative yourself. It had occured to me that JC’s flag should be a white flag with some green and red embroidery on the edges. Just wanted to say thanks. This is the great article and deserves to be published a lot more widely. Anand, the problem with Curry’s analysis is that she is equating the skill of the models with evidence favoring anthropogenic causation–and by extension, their shortcomings as evidence against. This 1)utterly ignores the fact that there is absolutely nothing that a model without anthropogenic forcing predicts better than one with it; and 2)the fact that the purpose of scientific models is insight into the physical system rather than matching the data to the last tenth of a percent. Both mistakes are frankly surprising for a scientist of her experience. The most charitable interpretation I can come up with is that Judy is at heart a small “d” democrat. Her inclination is compromise. That is a noble goal, as is her attempt to reach out to some of the more reasonable among the dissenters. Where Judy fails is in not being familiar enough with the evidence or the theory to avoid compromisint the truth. Nor does she seem to be honest enough to admit her mistake even when it is pointed out to her. I’m sorry, but there’s only so far science can go in reaching out to dissidents–and reaching out to those who have no evidence for their position crosses that line. Having done science journalism in the past, I do realize that narrative is essential. Hell, it’s reaaly essential in a good scientific paper. The narrative, however, must remain subservient to the facts and the science. Frankly, I think science journalism is in an abysmal state–in part because there are so few reporters assigned to the beat and in part because their readers don’t understand how science works. It’s like TV reality shows–they all write from the same script: emphasize conflict and the triumph of the lone maverick. Man against man. But there are other narratives: Man against nature, for instance. Scientists face a challenging problem. They slowly expose the facts from a reluctant physical reality and arrive at insight into the phenomenon. Maybe science journalists could learn something from studying Hemingway or Faulkner or even Mark Twain. Good science writing is at its heart good writing, and what makes good writing is ultimately strict adherence to the truth. By “getting down in the pit” I mean “respond with the same tactics”. I very much advocate scientists talking with people directly in order discuss and explain science. A good consistent example of this is Julienne Stroeve. She comments on a wide variety of blogs and sticks pretty much to the science and her area of expertise. She does a great job of bringing the science into the debate without appearing to advocate anything in the realm of politics or policy. Certainly some would call RC an activist effort but those same people would probably call Dr Mann’s published work an “activist” effort just as a creationist would call all of evolutionary biology “religious dogma”. I do not believe that scientists cannot make more noise on the dangers of climate change. The fear of the spotlight has something to do with it. The fact remains that you guys are the best qualified to tell the public what many just don’t want to hear. I applaud RC for what you are doing. We need more of it. Just how we get more of the media to pay attention I don’t know. I try to talk to people. Many times they just don’t want to know but I keep trying. A lot of those who deny the evidence secretly know it is happening but are too afraid to admit it to themselves. All we can do is keep trying and shout out when new reports are published. For example, the report of the Geological Society (http://www.geolsoc.org.uk/gsl/views/policy_statements/climatechange). This one says if we stay with business as usual the climate might take 100,000 years to recover – far too long for humanity and its civilisation wouldn’t you say? A thousand years before Galileo, there lived another man who challenged the received wisdom of the ancients and the orthodox consensus. On a fundamental question of earth science, he argued a position contrary to that of Ptolemy and the other established authorities, and contrary to contemporary mainstream opinion in the Christian Church. He may not have been branded a heretic, but he certainly was an outsider. Our lone hero was not a theorizer, a product of the ivory tower. He was a latecomer to academia, having first made his career a businessman, a traveler, and an observer of rare value: Where the scholars might discuss the marvels of farflung lands based on the fanciful writings of Pliny, this Greek based his book on direct experience, having earned his nick-name “the India-Farer”. A large part of his justly famous topographical work, however, concerned the shape of the Earth, about which he went on at great length. His name was Cosmas Indicopleustes, and he argued that the world was flat. Possibly the rise of narrative and the declining respect for scientific thinking are also linked with a more general shift from a modern/enlightenment/scientific world view to a post-modern worldview in which all claims to absolute truth and claims to authority are suspect. I’m not a sociologist though, so hopefully someone can else can provide a more useful opinion. If this is right however, then scientists need to understand the sociological shifts in order to effectively communicate to the outside world. Unfortunately I haven’t found anyone writing about sociological postmodernity (rather than philosophical postmodernity, the Sokal affair, etc) for scientists. And the sociology texts are a little impenetrable for the non-scientist. Storytelling is ideally a different way of presenting the information one has reported–it’s not one versus the other. We do it because storytelling is an ancient, familiar and compelling mode of human communication. The dry recitation of facts is much less so. Even some scientists, I’m guessing, will choose a novel over a textbook for recreational reading. It’s true that if more people read our stuff, the publisher makes more money and is happy. But from the reporter’s point of view, that’s hardly the only motivation, or the prime one. Furthermore, staff reductions leave reporters LESS luxury to write in a true storytelling mode. It’s not easier–unless of course you make up the facts. I’m sure that’s done sometimes, but it’s quite frowned upon. The problem arises, as I think I’ve said before, when the urge to tell a story leads one into distorting the facts–by, for example, playing up the clash of personalities, or suggesting a cause-and-effect relationship between facts where none exists. How about the fear of being burned (literally) at the stake. It seems there may be a concerted effort in the works to resume the witch hunts. I think (not that I count for much)that the current anti science climate is about much more than simple ignorance and denial. According to Newsweek, the White House plans to aggressively enforce environmental regulations as they anticipate efforts from Republicans to strip authority from the EPA. Compromise on renewable energy standards is possible, but the posturing between Rep. Joe Barton, the chairman of the energy committee, and the administration, may make this terribly difficult. The GOP plans to hold high profile hearings examining the alleged “scientific fraud” behind global warming, a sleeper issue in this election that motivated the base quite a bit. Perhaps the GOP is mostly backed by big oil and coal, or is that just a coincidence, eh? In defense of Indocopleustes, he didn’t argue that the Earth was flat per se. He argued that it was a half-cylindrical prism. Sorry, I meant “Indicopleustes,” of course. As a consumer of scientific outputs, this discussion is fascinating. Actually only new ideas really have the “potential to challenge previously held ideas”. Don’t take this the wrong way, but you have reinforced some of my impressions of the scientific process. My interest is primarily in promoting better policies in the energy-economy-environment domain, so perhaps you should think of me as a consumer of what you produce. As such I don’t generally require nth decimal point accuracy, but I do need analyses that are complete and logically consistent. – there is usually no prior public discussion of the correct general method of analysis – the “design” stage, if you like. An analogy may be to the software development process where it’s often a good idea to produce and review a high-level design before diving into the code. – the general consequences of the findings appear as discussion usually towards the end of papers. – maybe the discussion of implications of findings receives less attention from reviewers than the more quantifiable parts of the paper (though I can only speculate as no audit trail of review comments is made public). – the conclusions often overemphasise the importance of the data which is the subject of the particular paper. – theoretical models implied by the discussions and conclusions often ignore rather than estimate factors that have not been quantified or are difficult to quantify. In short, my impression is of too much reliance on “bottom-up”, rather than “top-down” processes. Incidentally, maybe this has something to do with the frequent sceptic claims that errors in, for example, the detail of statistical analysis overturn the conclusions of papers, even the whole vast edifice of climate science, when this clearly is not the case. Putting it another way, climate science is at the stage of what Kuhn would call “normal science”, putting flesh on the bones. But whilst that may be justified at a high-level maybe we should conceive of the science relevant to climate change as a complex structure, relying on interdependencies between numerous different domains. Some aspects of climate science, then, are still in flux. I’d argue that the methodology doesn’t always reflect this. Sometimes details are being filled in before the picture is clear. Climate science is obviously a domain of study that has real-world consequences. The goal of much science funding is to produce results that can inform policy decisions. It is obviously therefore important that analysis is complete, and as accurate as policy-makers require. My impression on those occasions when I take the time to study scientific papers is that the balance is usually towards less completeness and more accuracy. An example I have in mind is the effect of biofuel production on atmospheric carbon levels. I recently became aware of a paper Fargione et al, 2008, which discussed the carbon debt of land-clearing in order to produce biofuel feedstock. To be honest, the paper represents some progress, but nevertheless exhibits the flaws I describe. – the unsound implicit assumption that biofuels “displace” fossil fuel emissions. Over decades this is an absurd argument. No mechanism for keeping fossil fuels in the ground is implied, so we are just as likely to burn more carbon, i.e. the biofuel and the fossil fuel. You can’t “displace” the same fossil fuel year after year. – the opportunity cost in carbon storage terms of the land you’re growing the biofuel feedstock on. I’ve discussed the issue on my own blog in more detail than I can here. In sum, Fargione et al and similar papers present a great deal of more accurate data than is really needed at the expense of a complete and logically sound argument. It seems to me that scientific papers on other topics exhibit similar symptoms. Narrative is indeed a powerful tool for understanding the world. For those of us who have difficulty holding onto a mass of detail, it’s nearly indispensible. (I’m taking “narrative” in a pretty wide, inclusive sense here.) And neuroscientists have been known to argue that meaning arises in the first instance from emotion, rooted in the “old brain,” and secondarily from the newer structures of cortex and neocortex. The key is thorough reality-testing of alternatives by the “new brain.” This is most commonly short-circuited by an excessively narrow focus–“hockey stick” or “UHI” obsessions, anyone?–characterized by the self-censoring of relevant knowledge. IMOl, that’s one of the hallmarks of denialist discourse, and one of the ways in which you can assess an argument even when you don’t have the ability or background to deal directly with all the technical aspects of that argument. That’s important for layman trying to educate ourselves, and deciding just which apparent expert we can actually trust. Well, yes, at least if they are honest and competent. Why do you think the radical right is so determined to control education? I think, though, that scientists are about to experience another version of martyrdom. The radical right faction which controls the House is talking about holding hearings in Yet Another Attempt to discredit climate scientists. I wonder what narrative the media will construct from them? Tim Joslin, thanks for a thoughtful and substantive comment. My reaction–and I’m also in some sense a “consumer” of scientific information, but have also been at least a wannabe (non-“scientific”) scholar–is that you’re not taking fully into account two things. One, the “bigger picture” is held mostly within the ongoing subculture of those doing the science–especially in the case of highly technical papers, as opposed to, say, review papers assessing the state of knowledge. Two, it doesn’t sound as if you’re distinguishing clearly between policy papers and technical ones. I haven’t read the Fargione paper you use as an example, so I may be off base here. But more often than not, “scientific” papers, so-called, are going to leave policy to those (such as yourself) whose expertise is in that area. Maybe, in a sense, you’re selling your own expertise a bit short. As a sidebar to that thought, I’d disagree that new data can’t challenge established thought. It’s happened many times in science history; one of the late Isaac Asimov’s best examples were the Michaelson-Morley experiments. They weren’t even intended to make any big points; they just wanted to get a good, precise value for the speed of light. But the precision they achieved was sufficient to show that light wasn’t behaving the way anyone expected. The result was an overthrow of the concept of the luminiferous ether, a huge conundrum for contemporary theoretical physics, and the setting of the scene for Albert Einstein’s work. In climate science, improvements in infrared spectroscopy in the first half of the twentieth century had a large effect upon the viability of “the CO2 theory”; yet they weren’t even made with that theory in mind at all. And the field wouldn’t be what it is without the drive of Keeling to get really, really good data on airborne CO2 concentrations. The 2 Kevins,34 & 40. I’m afraid I agree with the post-modern analysis, with a strong dose of trivial individualism reciting the everyone’s-entitled-to-their-opinion mantra. As for assessing an argument, I despair at times. Educating the year 9 resistant to the idea that maths has to be done in a logical way and that the logical thoughts involved must be displayed is hard enough – until you try to convince the student’s parents of the same thing. I’ve never tried to convince any such clients of a scientific argument, but I’m pretty sure that Kevin (@40) is right about the emotional trumping the logical. In fact, it’s probably closer than that. When parents get protective about their children it’s very often defensiveness about their parenting that’s driving it. So for a newer ‘narrative’ to prevail, we need somehow to affirm a person’s faith in their reasoning and logical sense (their parenting skills) while getting them to face the uncomfortable truth about their mistaken denialist ideas (their uncooperative or not-too-bright offspring). Any undiscovered Mark Twains in the assembly here? It is cautionary that given space in a policy journal and a first-rate PR firm, Carl’s powers of comic invention could put Bozo’s to shame. The grimmest lesson of ‘nuclear winter’ remains largely unlearned– as a matter of cynical praxis, all that extraordinary claims require is access to advertising talent. Good of you to come to Cosmas’s defense (I didn’t mean to scoff, I appreciate his historical eyewitness accounts). Actually, I thought he argued for Earth as an oblong plane, shaped like the table in the Tabernacle, vaulted by more or less semi-cylindrical heavens… but in any case, not round. The moral of the story, I trust, was clear: The lone maverick defying the scientific orthodoxy of his day is sometimes right, like Galileo, and sometimes… not so much. Not so much, especially, when the heretical conclusions are based on ideology (in Cosmas’s case, the authority of a particular reading of Scripture) rather than on observations (as in Galileo’s case). Climate contrarians who have replaced Genesis and Exodus with Atlas Shrugged might want to take heed of the difference. Seems to me that you described the scientific process according to what it theoretically should be while describing the news process according to how you see it from the outside. A news person could do the same thing from the opposite perspective and it would be equally uninformative. I think it is disingenuous to claim that any scientific field functions so closely to the theoretical ideal. Every book on the history of any science is filled with stories of clashing personalities impeding the progress of science. It’d be nice to believe that science today is different, but I don’t see a justification to do so. I commend to everyone’s attention a relevant essay by Richard C. J. Somerville, Distinguished Professor Emeritus at Scripps Institution of Oceanography, published in October by the journal Climatic Change, entitled “How much should the public know about climate science?” [PDF]. showing that global emissions of greenhouse gases must peak and decline within the next decade if global warming is to be limited to a level that avoids severe climate disruption. Realistically, there may be no chance to educate the general public in depth about the science so quickly. Meanwhile, a well-funded and effective professional disinformation campaign has been successful in sowing confusion, and many people mistakenly think climate change science is unreliable or is controversial within the expert community. Thus, the more urgent task for us scientists may well be to give the public guidelines for recognizing and rejecting junk science and disinformation. If students today, who will be adults tomorrow, can understand and apply these guidelines, they may not need a detailed knowledge of climate change science. To that end, I offer the following six principles. 1. The essential findings of mainstream climate change science are firm. The world is warming. There are many kinds of evidence: air temperatures, ocean temperatures, melting ice, rising sea levels, and much more. Human activities are the main cause. The warming is not natural. It is not due to the sun, for example. We know this because we can measure the effect of man-made carbon dioxide and it is much stronger than that of changes in the sun, which we also measure. needed if global warming is to be limited to moderate levels. 4. The standard skeptical arguments have been refuted many times over. The refutations are on many web sites and in many books. For example, the mechanisms causing natural climate change like ice ages are irrelevant to the current warming. We know why ice ages come and go. That is due to changes in the Earth’s orbit around the sun, changes that take thousands of years. The warming that is occurring now, over just a few decades, cannot possibly be caused by such slow-acting processes. But it can be caused by man-made changes in the greenhouse effect. not do research and publish it following standard scientific practice, are not doing science. When they claim that they are the real experts, they are just plain wrong. reports can invalidate the reports. The first thing that the world needs to do to confront the challenge of climate change wisely is to learn about what science has discovered and accept it. The IPCC Fourth Assessment Report at http://www.ipcc.ch is a good place to start. The truly remarkable thing about science is that it yields reliable results even when practiced by fallible humans. As such, I would suggest that until humans become perfect beings, we should rely on science to guide policy. Tell ya what: you work on perfecting humans and I’ll stick to science. We’ll see who makes more progress.